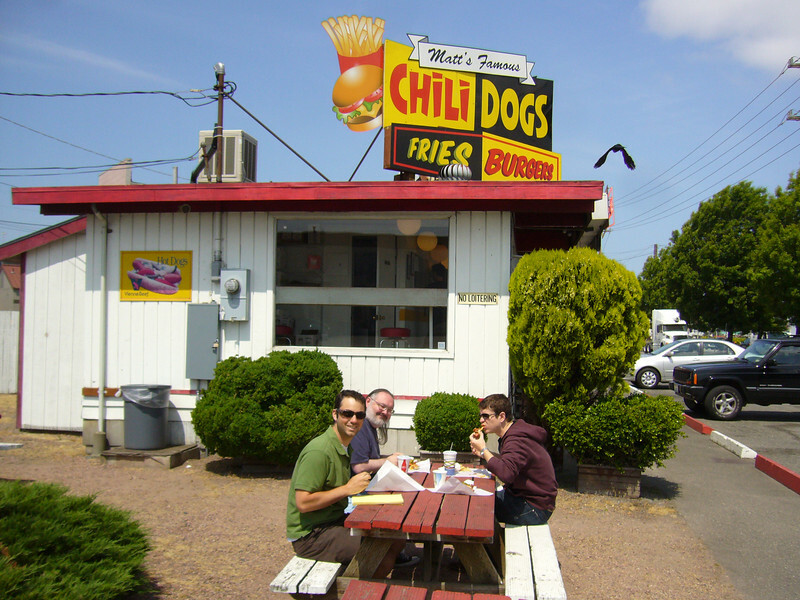 After more Street View scouting and an actual drive by on our previous lunch, we knew that today's stop for the PBR150 train was going to be Matt's Famous Chili Dogs. 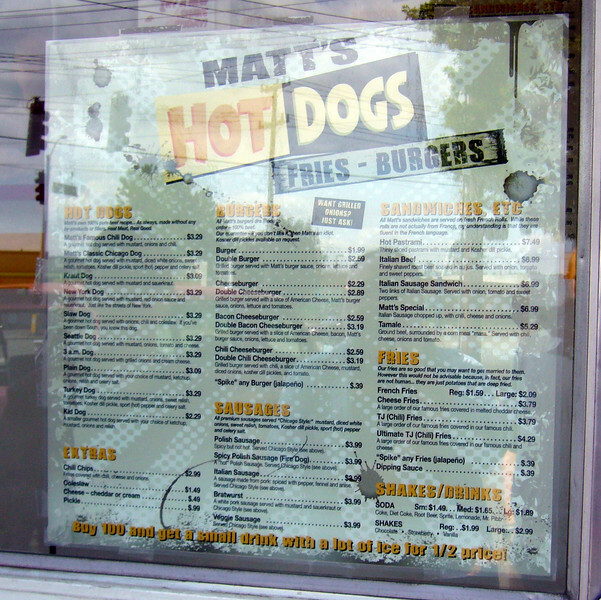 We embarked from our ID headquarters and arrived shortly at Matt's. On board today were Geary, Adam, Emmett, and Dave (no grabbing needed). 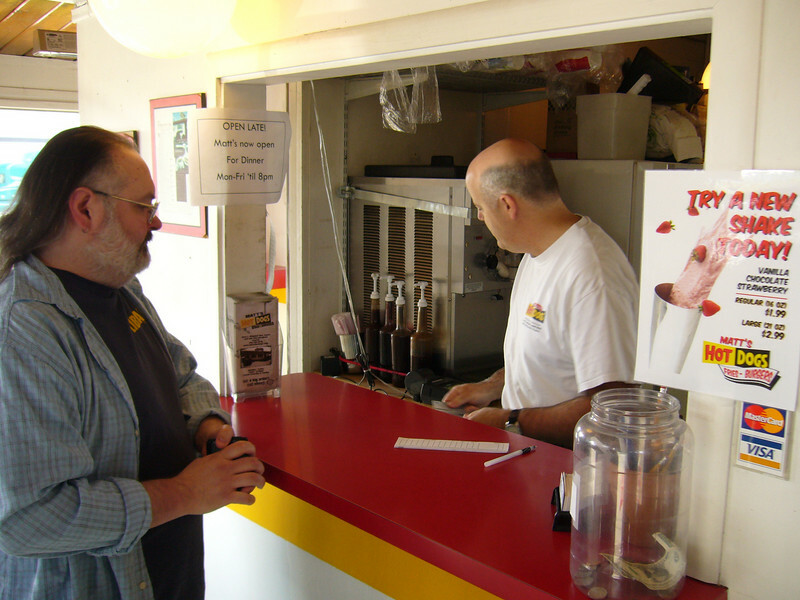 When you walk into this Matt's Famous Chili Dogs, you might actually be greeted by Matt. He was there with a smile on his face, a warm welcoming message, and a pen in his hand. He promptly took our order for high-priced saugage-shaped products, and delivered the goods only moments later. 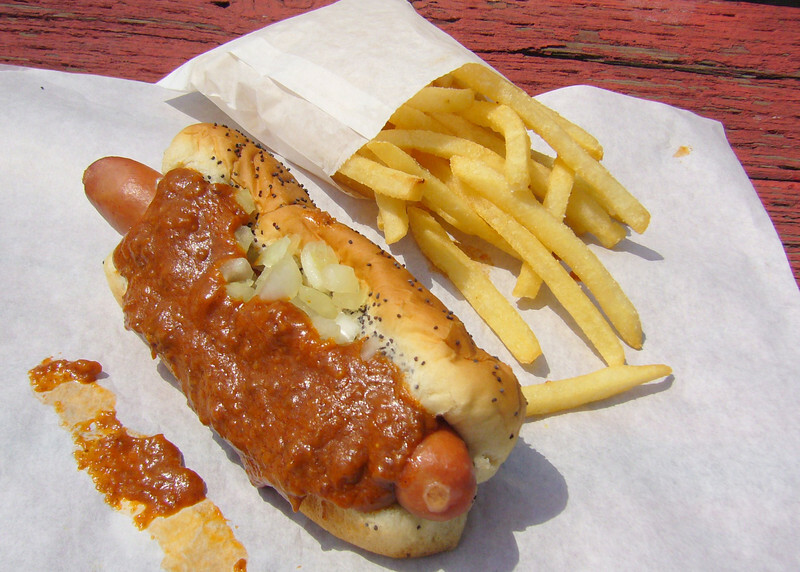 The Fire Dog is definitely delicious. I hate tomatoes though, so I chucked those mofos to the ground (or, maybe I just ordered it sans tomatoes... whichever sounds badasser). 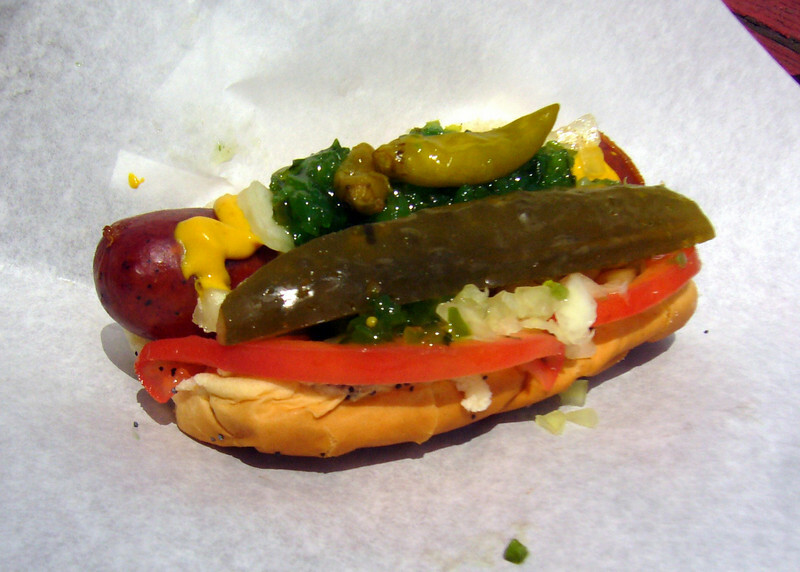 Bright green relish is the real eye-catcher on a Chicago-style hot-dog, and this guy had the relish in spades. A pickle spear, onions, mustard, and peppers finished off this spicy polish sausage concoction. In the end: delicious. But for $4, I would expect a little more out of a hot dog. I understand that businesses have overhead and need to cover some margins to make a profit... but I can't imagine that this hot dog had more than $1.25 of ingredients, so the 3x+ markup is a little high. Hot dogs are awesome when you're drunk, but lack that extra "pop" when it's before 2AM and you're not being forced onto the streets of Seattle by a huge bouncer named Tug. I lived in Chicago during its glory years (1984-1986 - Super Bowl Shuffle baby). I was also at the age where I pretty much ate hot dogs every day. Consider me an expert. Matt's has a shiny colorful storefront. You can't really miss it driving down Marginal Way. 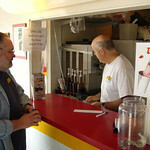 We were greeted by Matt, who was working the counter, and got us our orders right quick. I went with the original, no mustard, plus fries. The hot dog was solid - tasty, cooked just right. The chili was just average. I like my chili with some zing, and this was kind of plain, and didn't do much for my taste buds. The fries were fresh, but overly salted. I went back for Bratwurst, with grilled onions and a little mustard. It was a good brat, but to be honest, it's gotta be a little charred on the outside to make me happy. It wasn't working for me. They have great, fast service, but a little expensive. Two dogs will put you in the $7 dollar range, not including a drink. Having been to Matt's numerous times before I was eager to return. It's been a few years. This is the original Matt's and has been a Georgetown institution since 1986. It's a small hut on the edge of an industrial block with a brightly painted sign on top. There's a dive bar next door and a few picnic tables in a small grass pad off to the other side. There is some inside seating as well at a few stools along a bar looking out. Matt, himself, was working the counter today and greeted us with a friendly smile. Clearly he didn't know what we were up to. I ordered the Fire Dog from the Sausages section of the menu. 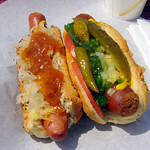 This is a hot polish dog served Chicago style with onions, relish, peppers, tomato, and mustard. 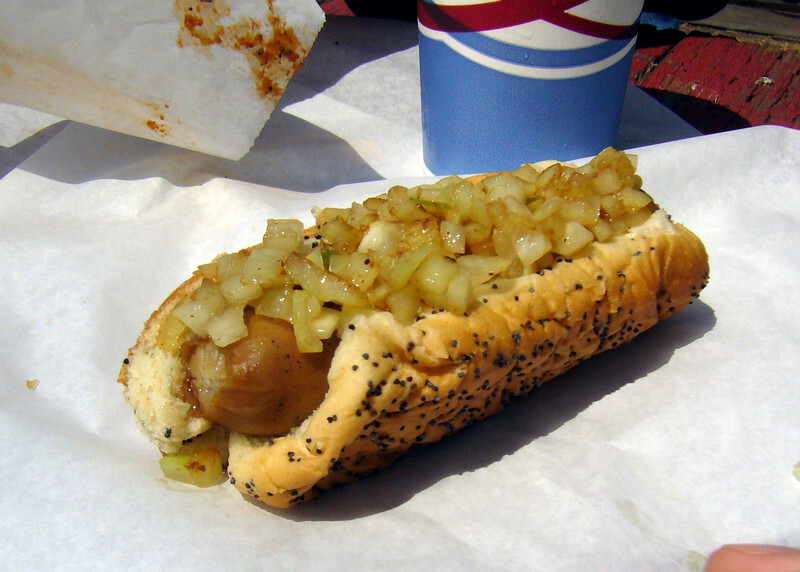 Looking to try something new I threw in a New York Dog, a standard dog with sauerkraut, red onion sauce, and mustard. 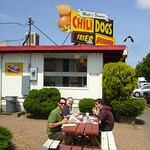 The order was up quickly, and we grabbed a table in the sun outside to enjoy our dogs. 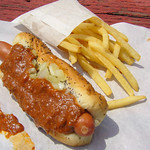 The Fire Dog was as delicious as I had remembered. 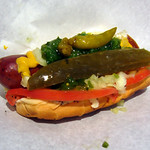 The little peppers are crisp and together with the spicy polish sausage and other fixin's make great dog. I was not as impressed with the New York Dog. The red onion sauce was overly sweet and it lacked any sort of flavorful punch. Maybe it requires ambiance of honking taxis to fully enjoy. 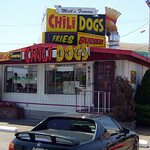 Matt's serves a great dog and as long as you stick to the Chicago style dogs you can't go wrong. It's a bit spendy for a two hot dog lunch, but I'm willing to pay the extra price occasionally for the pleasure. 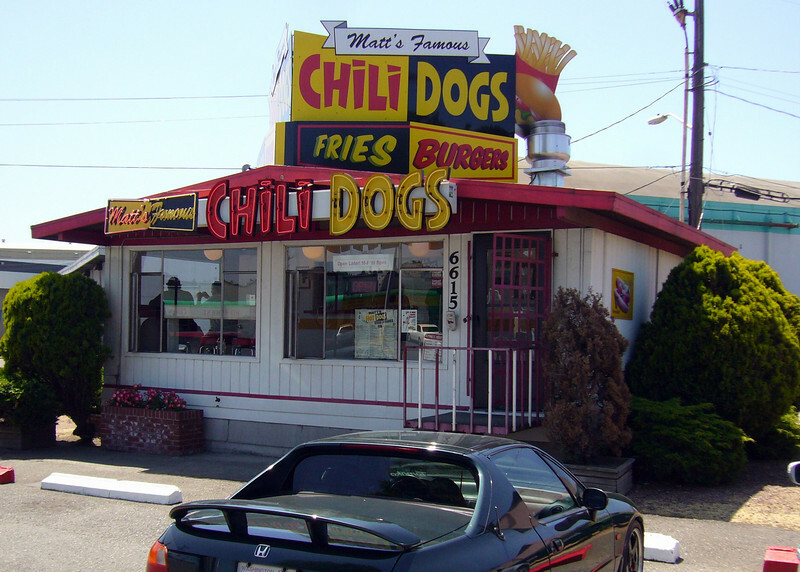 i have fond memories of the matt's in bellevue, even though it wasn't the original. i'd been there a number of times and met people there for lunch a lot, and i generally associated the place with good times. since they closed down i hadn't had a good chicago- style dog, so i was looking forward to hitting the original and seeing if it was as good as i remembered. short answer: not quite. 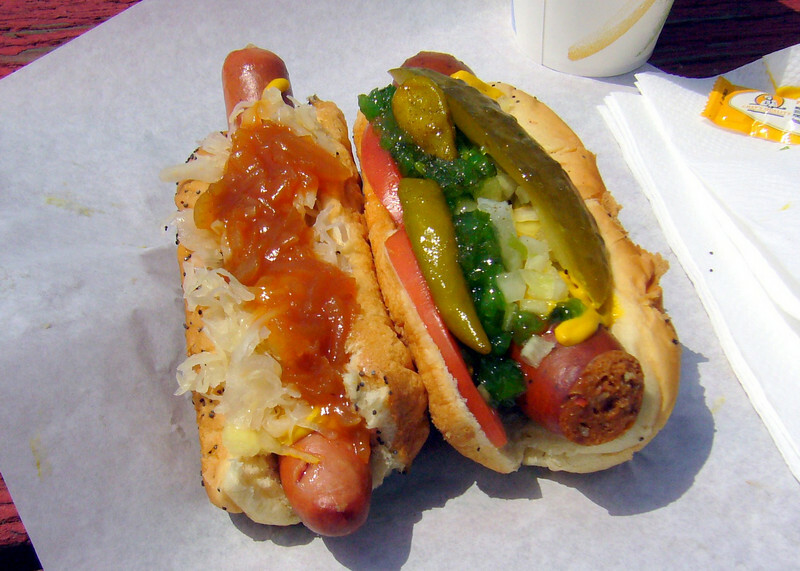 we get there and i decide to try something other than my erstwhile usual (two fire dogs, chicago style). 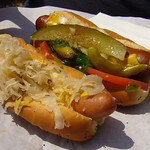 i get one fire dog chicago style and decide to try the kraut dog. the fire dog was great. if anything it's spicier than i remember, and it's a nice hefty sausage. the pile of fillings is always a challenge, and as usual i ended up eating half of it off the napkin, but i definitely enjoyed it. 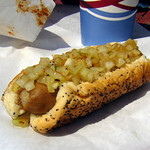 the kraut dog, however, was a letdown. 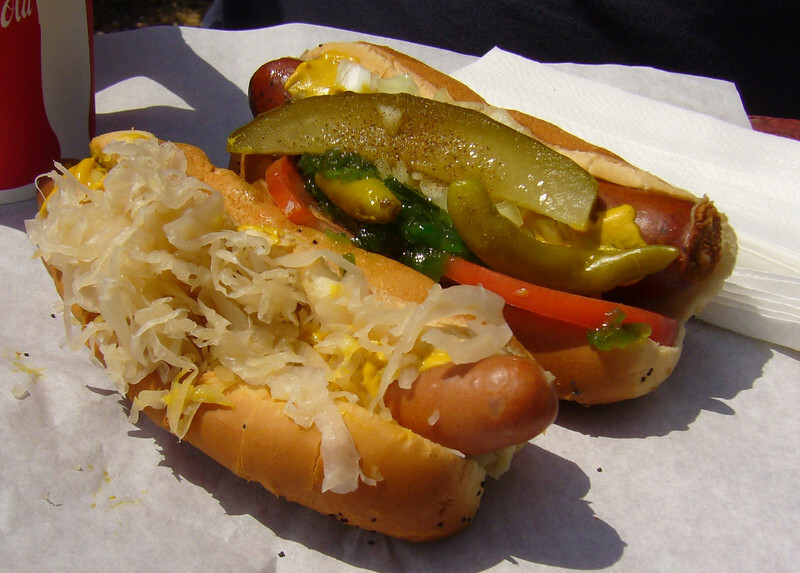 rather than a big, meaty sausage, this was just a run-of-the-mill dog with run-of-the-mill kraut and mustard. not awful, but not something i couldn't have just made myself at home. and for way less than $3, too. 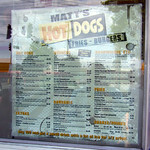 which brings me to my other complaint; i may be misremembering, but to me matt's was a cheap, filling meal. the "buy 100 and we'll throw in a free small soda that's mostly ice" shtick works a lot better for me if i feel like i'm getting my money's worth. i know prices go up and portions go down; it's the natural order of business. but a couple of dogs shouldn't run me $7 and leave me feeling hungry. if the crowd's going, i'd tag along, but i'd avoid the plain hot dog options.